Sorry, this competition is now closed! Congratulations to Satya Bhat from Warwickshire who won! For more competitions, visit: https://www.thehecticvegan.com/competitions! 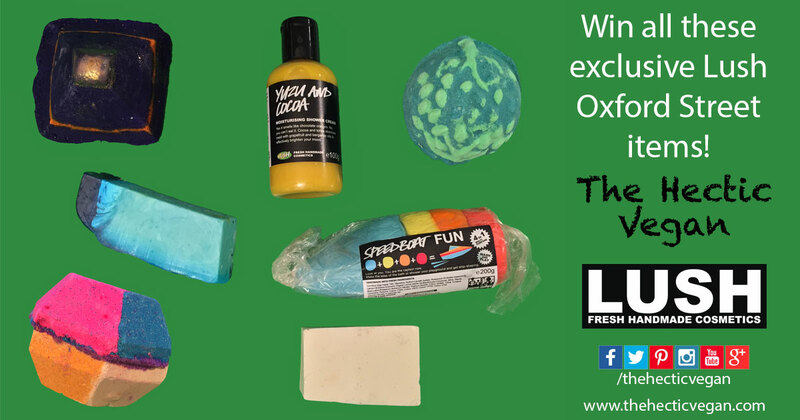 After visiting the new flagship Lush store on Oxford Street in London, I thought it was such a shame that so many people would miss out on the 200+ exclusive items only available in that one store, so what better than to buy a load and give it away! There’s a good selection of things here: 2 soaps, 2 bath bombs, shower cream, FUN, and a bubble bar. That's nearly £30 worth of stuff you can only get if you visit London! So how and when will the winner be announced?